Paris was occupied by Nazi Germany on June 22, 1940 since the signing of the Second Compiègne Armistice. 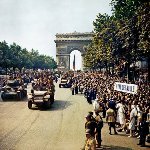 Liberation of Paris began on August 19, 1944 with the uprising against the German garrison. The 2nd French Armored Division led by General Philippe Lecrec fought its way to Paris and seized Hôtel de Ville on the night of August 24. The next morning the 2nd French Armored Division and the 4th U.S. Infantry Division entered Paris. German garrison surrendered to the French and they assumed control of the city. Liberation Day of Paris is not a public holiday in France, but at the same time this day is very important for the Parisians. Grand events are organized in the city on August 25. They remind the citizens about the importance of this date. In 2004 on the 60th anniversary of Liberation Day two military parades were organized. One of them was on August 26, the other was on August 29. One parade represented the French, the other one represented the Americans, who contributed into liberation of the city.